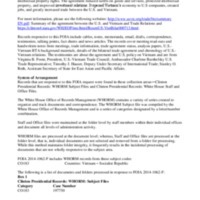 This collection consists of records related to the 1996 Bilateral Trade Agreement negotiations with Vietnam (BTA). The BTA was signed on July 13, 2000 in Washington by Trade Representative Charlene Barshefsky and Vietnamese Trade Minister Vu Khoan. The decision by the U.S. to pursue the trade agreement was made after Vietnam had established a record of cooperation in accounting for POW-MIA's from the war, the highest priority in our relations. The files contain cables, notes, memoranda, email, drafts, correspondence, testimonies, talking points, fact sheets and news articles. The records cover meeting read-outs and handwritten notes from meetings, trade information, trade agreement status, analysis papers, U.S.-Vietnam BTA background materials, details of the bilateral trade agreement and chronology of U.S.-Vietnam relations.